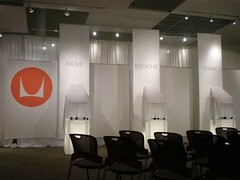 So last night Continental Office Environments held an unveiling event for Herman Miller's Embody. I was hoping that it wouldn't be so much pomp & circumstance and more "please take a seat in HM's latest chair." The event opened @ 5 and things really didn't get started until 6:15. Everyone seemed to know each other--so it was a little clique-ish. I didn't bother asking around where people were from, and I had to leave early. Thus, I never saw the chair, except as presented above. Overall, the experience was kind of lacking, but I got free beer and h' orderves out of it (Thanks COE!). Is Your Patron a Tagger?